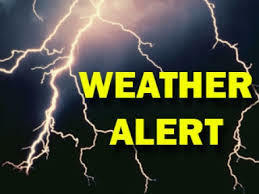 The National Weather Service Cleveland has issued a Severe Thunderstorm Watch from 4:30 pm until 11:00 pm for Morrow, Crawford, Knox, Richland, Marion and surrounding counties. At 4:17 pm EDT…Doppler radar indicated a thunderstorm over Mount Gilead moving east at 15 mph. Locally heavy rain will accompany the storm. Through 5:30 pm the storm will be impacting Mount Gilead, Fredericktown, Cardington and Chesterville.